In 1989, two Moroccan brothers, Mohamed and Karim, moved to the United States in search of better opportunity. 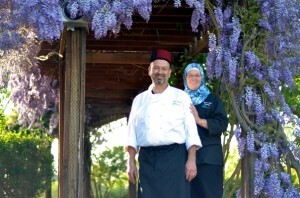 Business has a major part of their lives, they went into business together in 1995, operating ﬁrst a deli shop on Foothill and Broad in the city of San Luis Obispo called Boomers serving only Moroccan and Mediterranean Sandwiches. Shortly after, the two brothers became more interested in transforming their deli into a Moroccan Restaurant called Morocco. After many successful years, the brothers decided to expand their business and move their restaurant to downtown San Luis Obispo with a new name Oasis restaurant and Catering. The Restaurant has seen some changes throughout the years, including the move of the aunt and uncle back to Morocco, and the passing of Mohamed in 2006. Moroccan Cuisine has long been considered one of the most diversified cuisines in the world. It is a mixture of Arab, Berber, Moorish, Middle-eastern, Mediterranean, African, Iberian, and Jewish influences. At Oasis Restaurant & Catering Chef Karim gives the true experience of the Moroccan cuisine using family recipes passed-down from Mother to Son. Karim’s Mom Fatiha comes from Fes a city in Morocco that stands out with its own cooking style. Most top Chefs in Morocco are usually from Fes. Because Fatiha is well known in the family for her cooking skills. She always volunteers her services as a traditional and authentic Moroccan Chef to most of our family and friends in Morocco that are having a wedding or celebration event. To schedule an appointment for your tasting or to contact us just email us directly at oasisrestaurant.catering@gmail.com or text Chef Karim at 805 -459-9348.